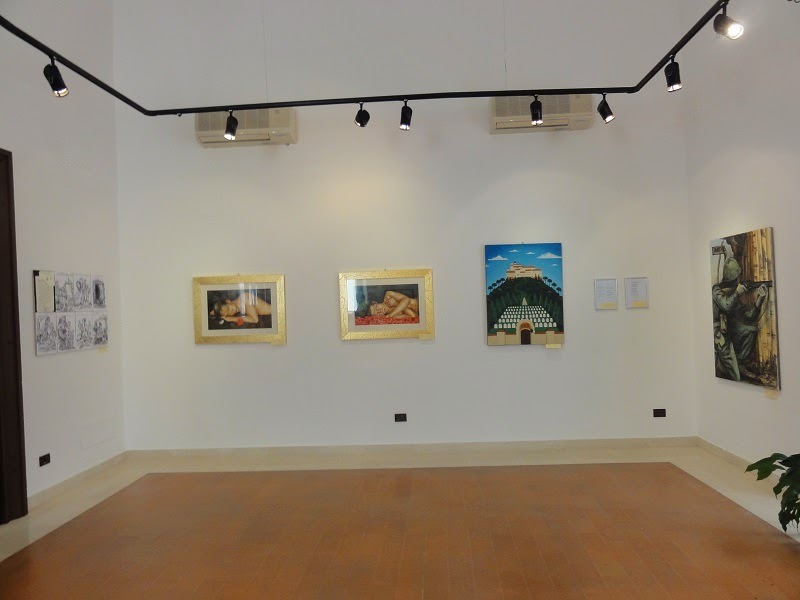 Monte Cassino Foundation for Remembrance and Reconciliation (MCFRR) Exhibition: Legato. Themes: Peace and Remembrance. 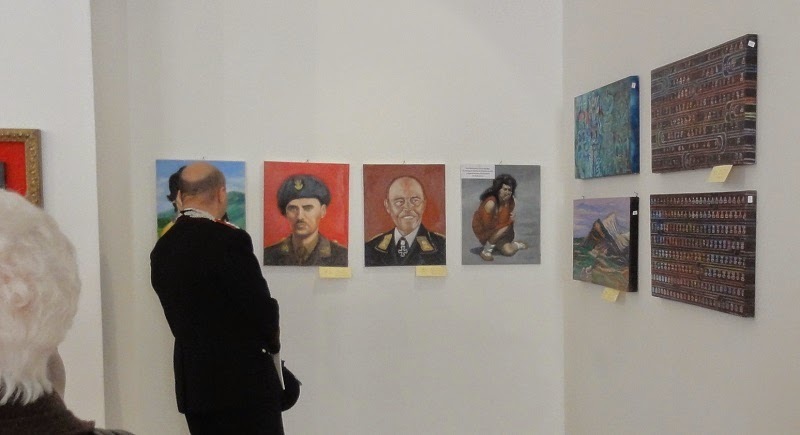 Please use links from this post to see photographs of the Legato exhibitions 2014. 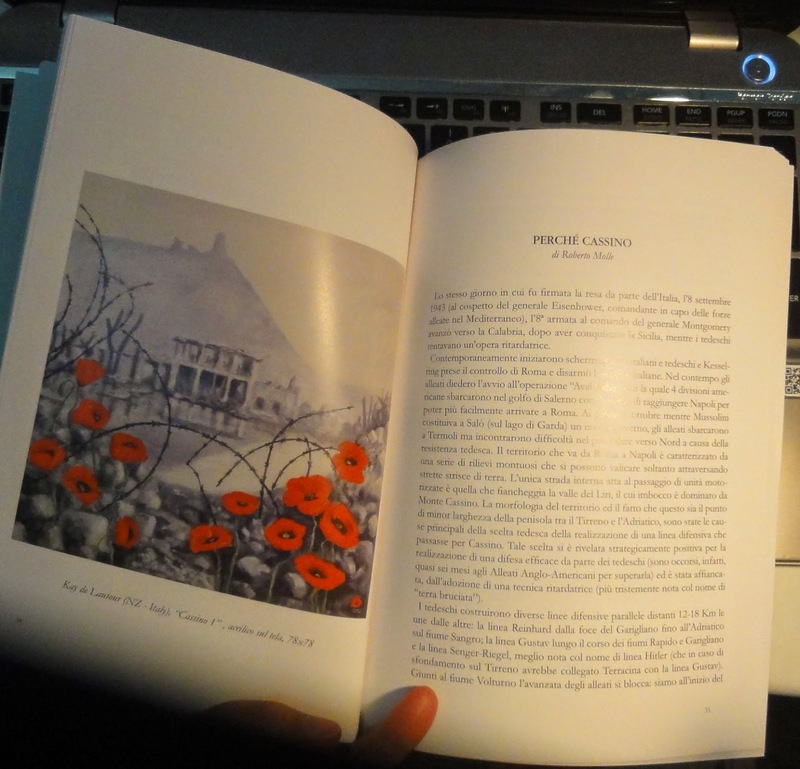 "Return to Monte Cassino" guest exhibitor Maree Wilks. Preparations for Legato 2014, part of the commemorations for the seventieth anniversary of the end of the battles for Cassino, are well underway. Over 100 artworks by 37 New Zealanders will be on display in Cassino, and 12 artists are planning to be here in person. The exhibition is also being supported by the Ngati Ranana culture group from London. 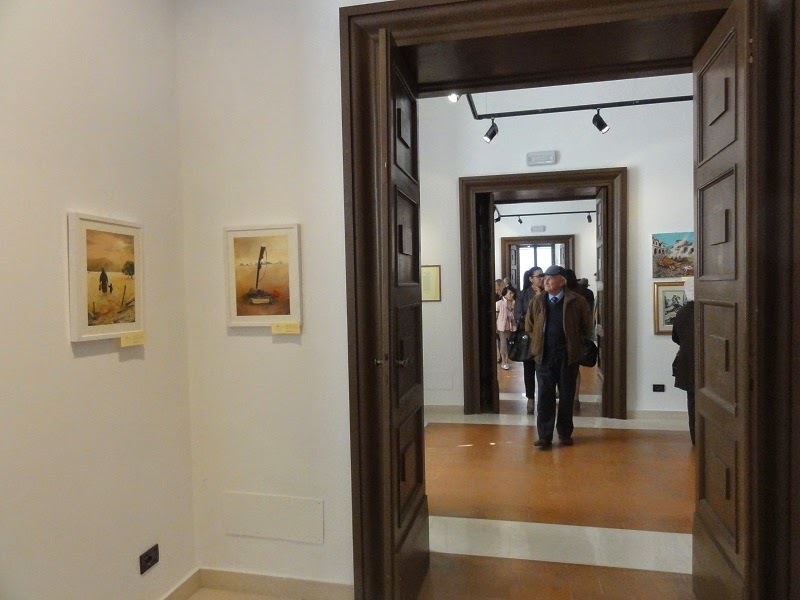 The opening event is at 1pm on Saturday 17 May in the Sala Pietro Malatesta, Biblioteca Comunale, when the exhibition will be opened by His Excellency Dr Trevor Matheson, New Zealand Ambassador to Rome. A second opening event and blessing will be at the Historiale on Sunday 18th at 4.30pm when the exhibition by guest exhibitor Maree Wilks is formally opened (it will be able to be viewed prior to this). Legato was established by New Zealand curator and organiser Kay de Lautour Scott in 2010 after discussions in London and in Italy with veteran Douglas Lyne (1921-2010), founder of the Monte Cassino Foundation for Remembrance and Reconciliation, about the role of the arts in international understanding and cultural exchanges in peace work. While essentially a New Zealand exhibition, approximately 60 artists of seven different nationalities have contributed to Legato to date. To help newcomers to Legato find their way around the blog and videos, here are some useful links. Thanks to Nicola Blackmore of feijoafilms (Scotland and Melbourne) for travelling to Italy to produce these videos in 2010. The Associazione Linea Gustav - Centro studi e ricerche storico militari, in their museum space in the grounds of The Historiale, Cassino, will host the guest exhibitor at Legato this year, photographer Maree Wilks. Maree travelled to the 60th commemorations with New Zealand veterans, and this exhibition is the pictorial record of that journey back to Cassino. 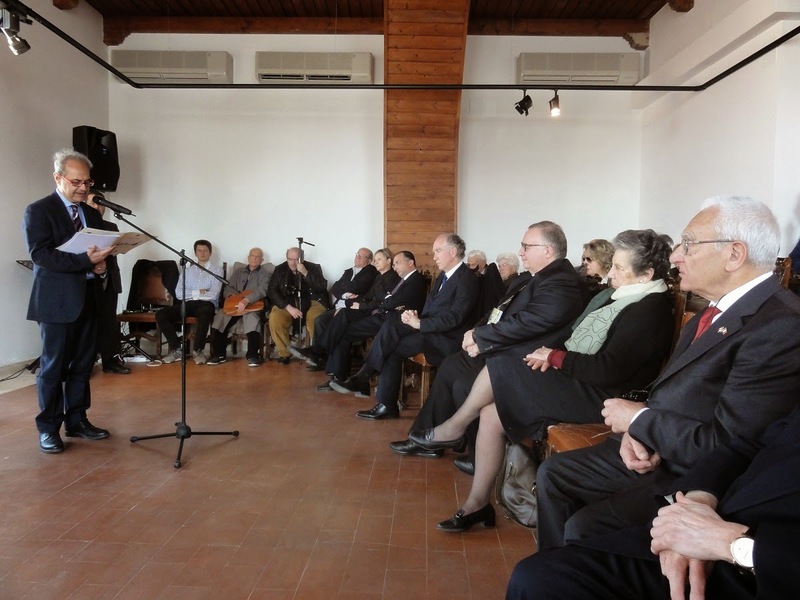 The official opening of "Return to Monte Cassino" will be included in the main opening of Legato in the Biblioteca Comunale venue. In addition, on Sunday 18th May at 4.30pm, after the New Zealand service at the Commonwealth Cemetery, the Maori Culture group, Ngati Ranana, who are supporting Legato, will perform in the grounds of the Historiale at a second event to dedicate and open this exhibition. This event is the day after the official opening of Legato at the Sala Pietro Malatesta, Biblioteca Comunale, on Saturday 17th May at 1pm. Sunday 18 4.30pm, in the grounds of the Historiale (near the railway station). 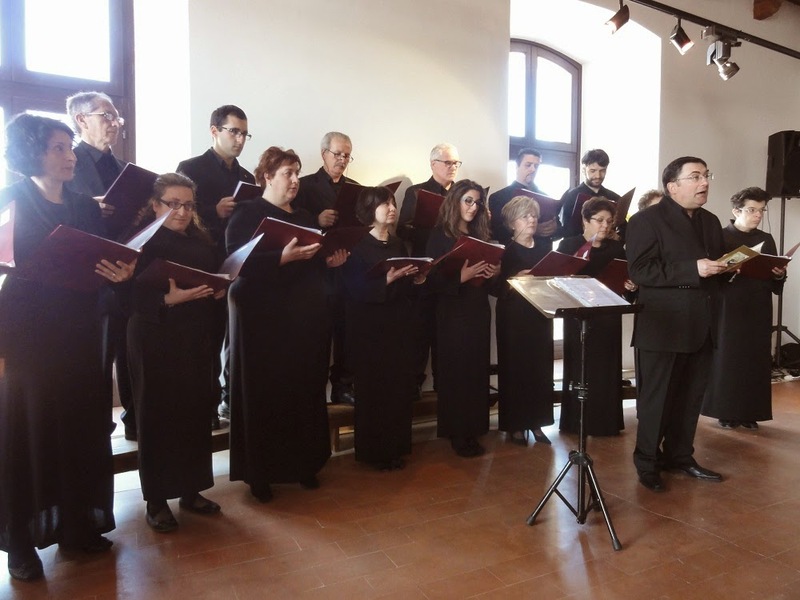 Legato goes to Ortona with the MCFRR and the Comune di Cassino. Ortona on the Adriatic Coast is twinned with the city of Cassino. The "Gustav Line" which was established and vigorously defended by the Germans stretches from the Adriatic coast near Ortona across Italy, linking the towns in this battle in the winter of 1943/44 (until the liberation of Cassino in May 1944). 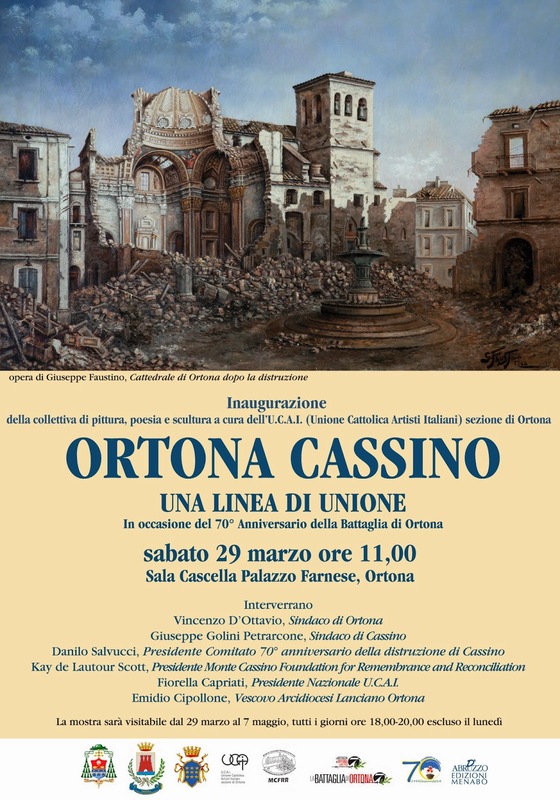 For the 70th commemorations of the Battle of Ortona, the Comune of Cassino joined with the people of Ortona to present an exhibition for commemoration, "ORTONA CASSINO una Linea di Unione". 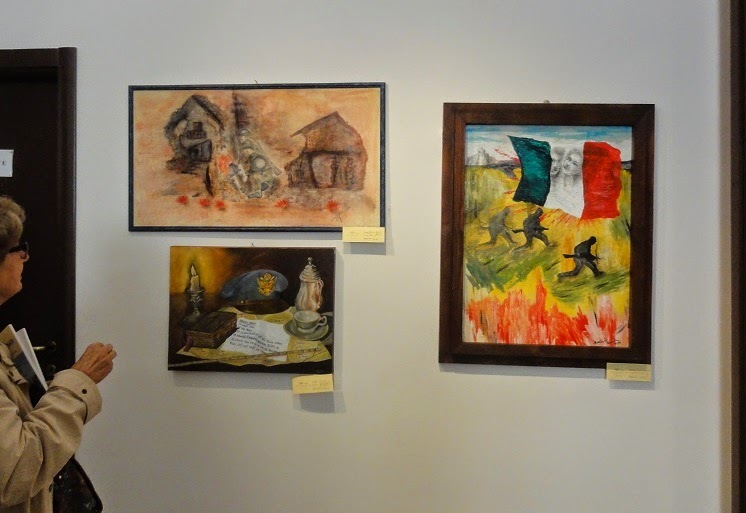 The Monte Cassino Foundation for Remembrance and Reconciliation (MCFRR) was invited to present works from Legato in a joint exhibition with local artists from the Ortona branch of U.C.A.I. The magnificent venue in the Palazzo Farnese gave some of these works their best showing aesthetically, as larger works are a little difficult to display in local spaces with set size openings or where walls are marble or plaster. 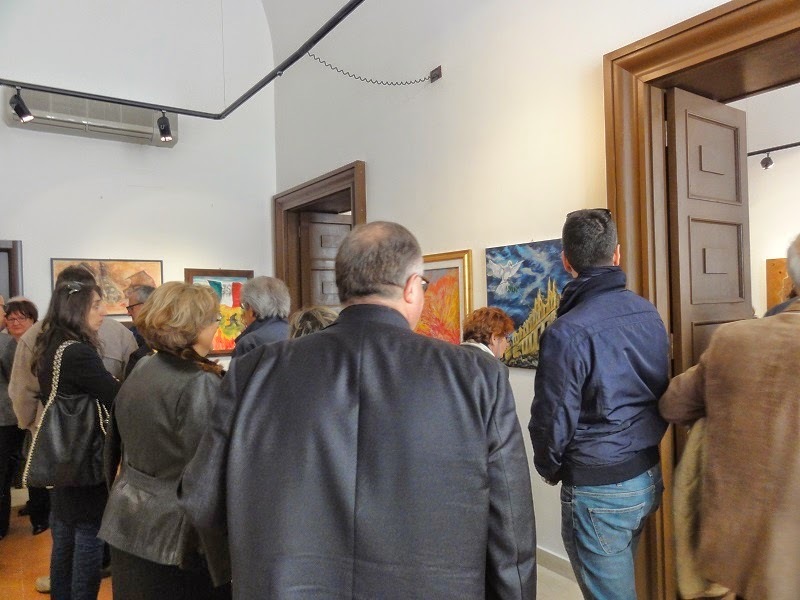 Below are some of the photographs from the event, but because the rooms were so full of guests and people were wanting to ask questions and discuss individual works I was not able to get many good photos showing the works to advantage. 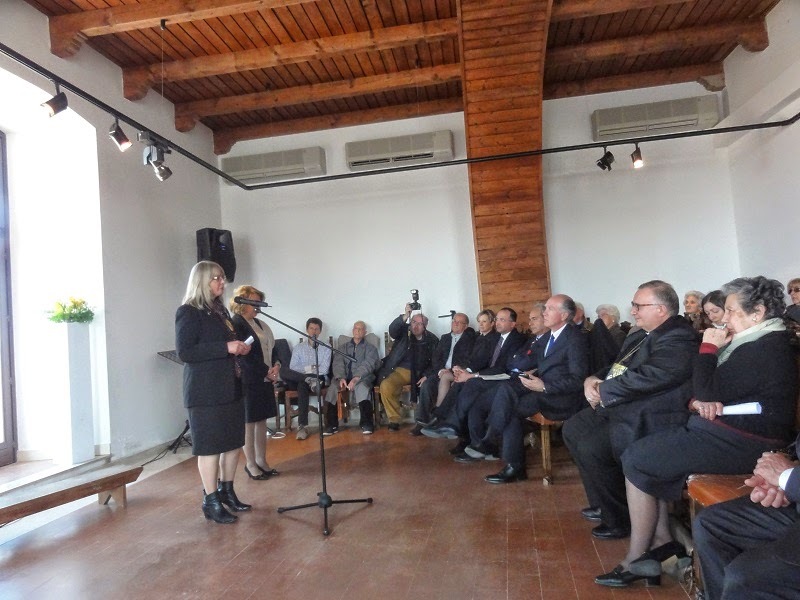 The event was opened with powerful choral singing, speeches and finally a visit to the exhibition. 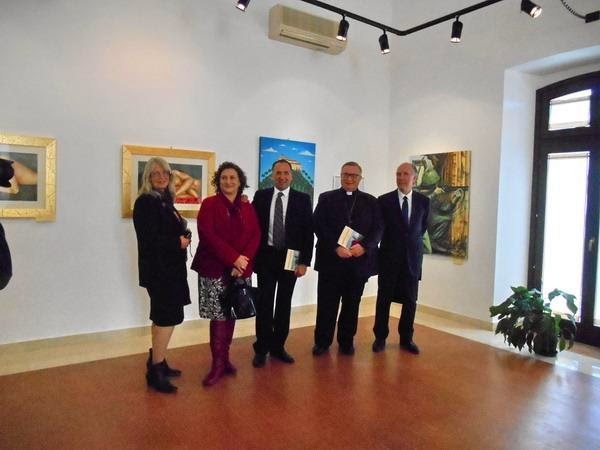 I was very pleased to hear the Monsignor advise people to look carefully at the visiting works and to consider the messages that were within them. He had clearly spent some time contemplating these himself. Art (images) and music are very international languages. Sometimes they allow people to unlock things that have been buried for too long. It is wonderful to hear, five years after the first Legato, how works are continuing to have an impact on the people who contemplate the images. 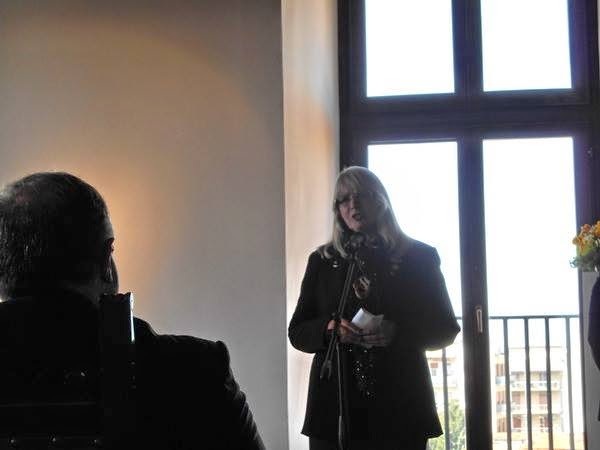 I offer a very sincere thank you to the artists who continue to allow me to share their works in Italy. The cathedral choir opened the event. 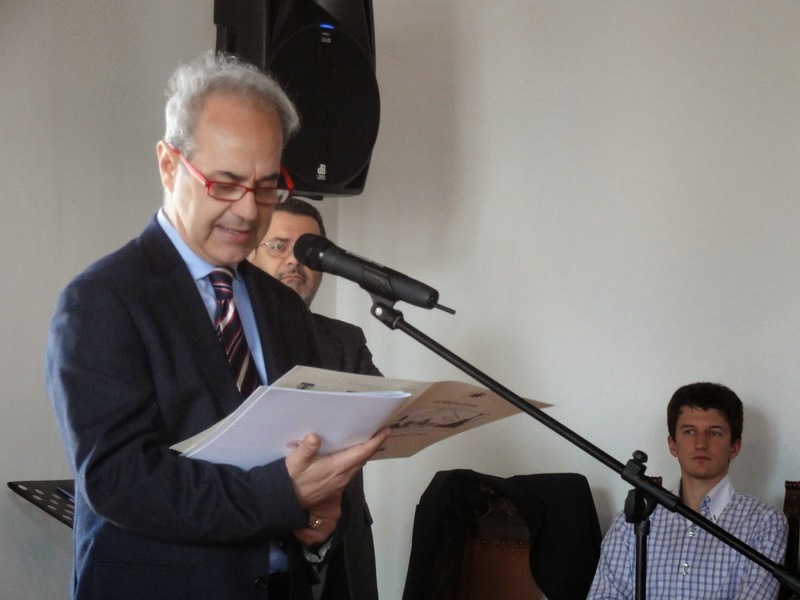 Dr Danilo Salvucci, (Consigliere Comunale and president of the committee for the 70th anniversary of the Battle of Cassino) represented the Comune di Cassino. Kay de Lautour Scott represented the MCFRR and Legato Exhibitions. As we approach the fifth year of Legato it seems appropriate to review the origins again. What is Legato, and why do I dedicate so much of my time and energy to it? The answer is simple. 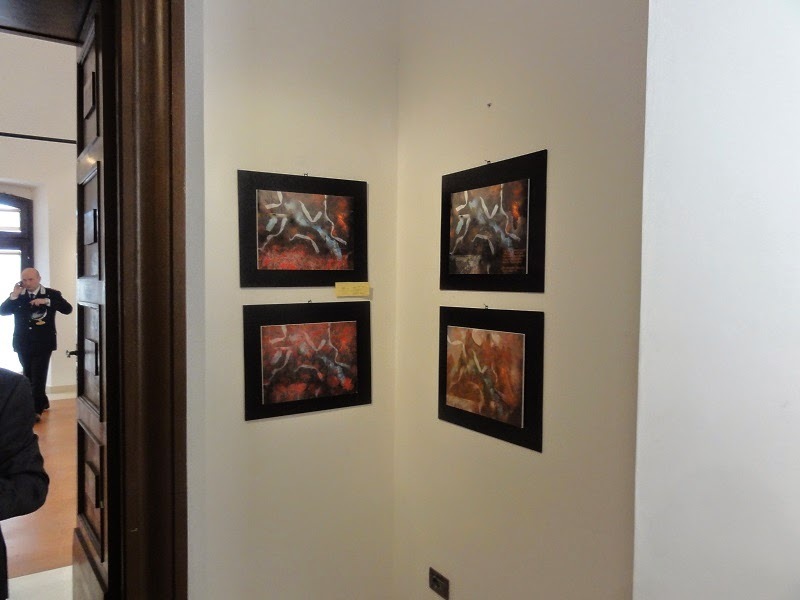 In 2005 I was offered the chance to exhibit in Cassino. This exhibition brought me closer to the realities of war. As an artist and a person it was life changing. 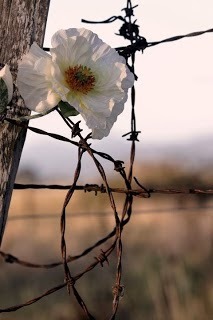 I became much more aware of the legacy of war, and of how much we are still a long way from living in peace. I wanted to offer other artists what I had been given in 2005 at the Battle of Cassino War Museum. Legato has given artists a specific reason to talk with veterans, and I now see that it has served both the veterans and the artists equally well. The veterans have a chance to revisit their memories in a warm, responsive context, sharing as much as they need to, without pressure to record for history what they may choose to forget. The late Douglas Lyne (MCFRR) encouraged me to think big. I had hoped to offer artist residencies but instead Legato was born. This is how I saw it in 2010: I think it still applies now. 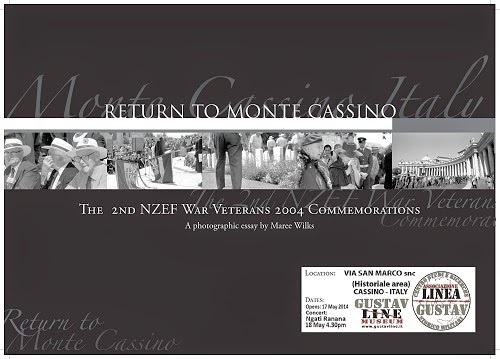 New Zealand artists will be exhibiting in an exhibition for peace and remembrance in Cassino, Italy, 15 - 29 May 2010. 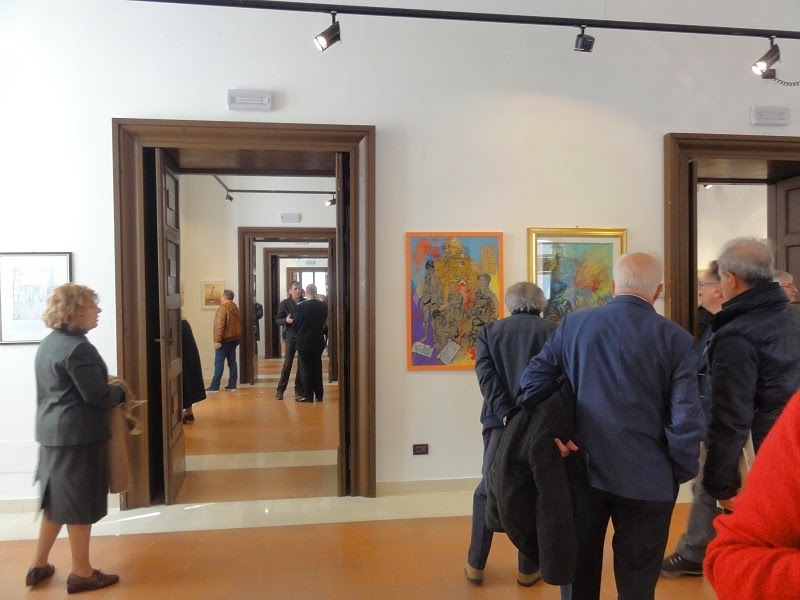 The venue is the Pietromalatesta rooms, Bibilioteca Comunale, in central Cassino, and the exhibition will be hosted by the Cassino Comune. Here, in tourist destination Italy, I live in a country that was destroyed. The battle front stayed in this area for 5 months. It is unthinkable how the people suffered, and still do live with this history in their daily lives. I see museums showing the military side of things, the strategies, the equipment, but it is the photos and stories of emotional pain and suffering that touches me most. I work as a volunteer with visiting veterans groups, with memorial museums and as a battlefield tour guide. Many veterans share their stories, and all say sorrowfully that we must never let such events happen again. To share time with these old soldiers, and then see what is happening still all over the world, leaves me feeling that I must try to do something, however insignificant it might seem. I see curating an exhibition with peace and commemoration as a theme as a way of passing on the message from the veterans that I meet, that war must end. 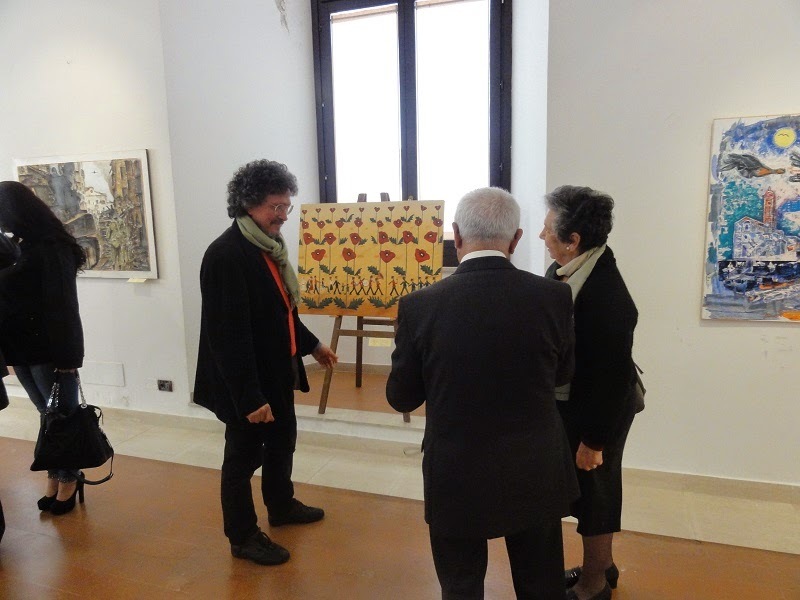 I also see it as a great opportunity for NZ artists to exhibit in Italy. I appreciate that side of it as I had a similar chance in 2005, but more important to me is keeping the peace message alive. We see Anzac Day parades growing in strength. I believe the time is right for artists to reinforce the peace messages coming from the soldiers who fought in this battle. I think that artists have a responsibility to reflect what is happening in society, and in fact they do that whether they are conscious of it or not. The immeasurable, unrecorded history is that of the returned soldiers, the waiting families, the changed lives in far away New Zealand. How far did the events in Europe ripple through our culture, contributing to the society we have now? What effect did the trauma of battle have on the young men returning home to families who could not begin to understand what they had been through? What was the effect of the waiting, the pain of loss, on the families that remained behind? If giving artists this opportunity gets them talking to their family and friends then I think that the movement towards peace has already become stronger, and this movement will be recorded in their future works. If we all do a tiny part in a move towards international peace we must eventually reach a tipping point where we can change nations and governments. One British veteran talks about "pax in spinus" (peace from thorns) and I see that as being appropriate here. If we let this continue, never learning, then there is no sense in sending soldiers out believing that they are contributing to peace. While I believe that no war ever brought real peace, we can't ignore what has happened either. Peace comes from a different place, but war history and commemoration is a place where we can start to talk about peace. Cassino was completely destroyed and is recognised as a martyr city. It has a lasting place in New Zealand history, so where better place is there to call NZ artists together to work for peace? It is my hope that these artists will continue to learn more about what happened here, and in other places, and continue to produce works that further the work of peace movements throughout the world. 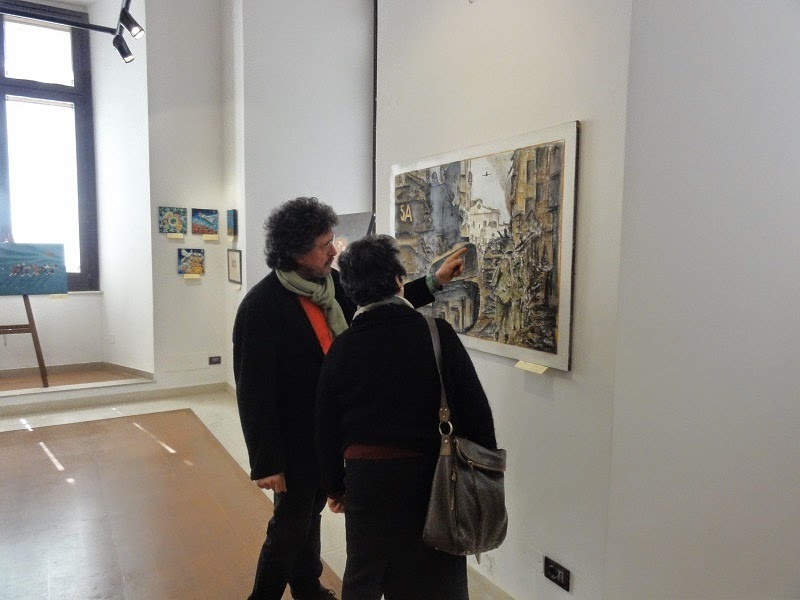 Ortona, 30 March - 7 May 2014. Via del Carmine, near Corso Della Republica. Opening event: 1300 17th May 2014 at the main venue. Ngati Ranana (London based Maori culture group) will be performing at both opening events. Featuring New Zealand, Italian, and Canadian artworks. Thanks to the Banca Popolare del Cassinate and the Comune di Cassino for generously providing the venues for Legato 2013.
on the occasion of the presentation and dedication of the bronze medal for valour to the citizens of this town. 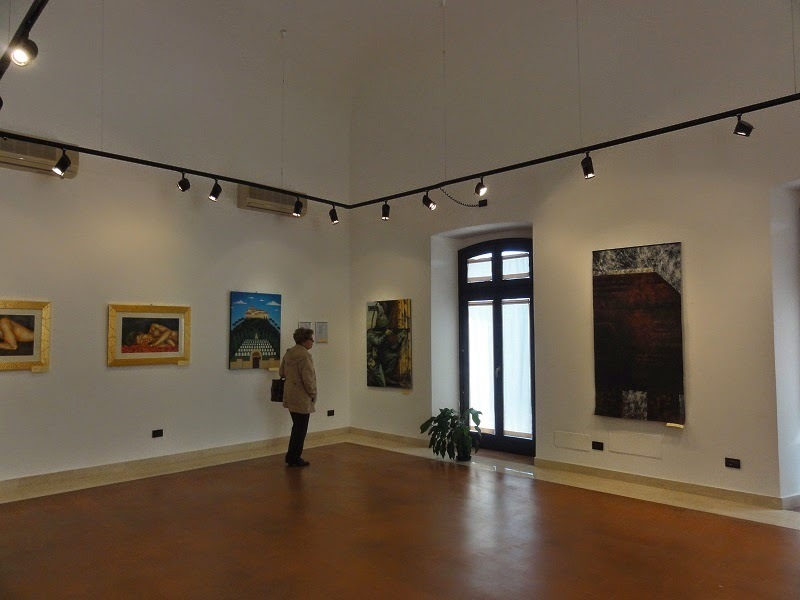 Exhibition in la Sala Teatro "Cimello", Piazza G Marconi. Featuring Italian, Canadian, British and New Zealand artworks and photographs. Featured artists Cassino artists with Kay de Lautour. Mother's Day is a Peace Movement.